Comment on YoshiStar's Metroid Prime Box Art / Cover. - I was going to abandon this. It was more of an experiment. But some people thought it had potential, so here it is! - I thought the Metroid series would look great with a grunge look, so I tried my best to find that perfectly fitting grunge style. I don't know how well I succeeded. - The original file is large but a lil bit blurry, unfortunately, due to the low-resolution renders I could find. - I created the entire template. To do it, I downloaded the Gamecube font, found the cube logo, and applied various effects to create a nice, extremely large Gamecube template. - Honestly, I'm not in love with this box. I just think its worth an upload to the site. Temme what you guys think! :) I may do an update if there's something that NEEDS to be there that's not. Overall, I'm not too satisfied with this, but whatever!! Holy hell, this is amazing. Oh, I forgot! Special thanks to everyone that helped me out in the critiques forum. They really really REALLY helped me like hell. So yeah. Thanks a lot especially to sd1833, beardedwalrus and Spiner! The washed out a muted colors looks really great in my opinion, and add to the "alone on a strange planet" concept Metroid has always been about. I never understood why all the official always used such boldly colored illustrations. #5, Yeah, I don't know why they use those boldly colored images. Not to brag, but I think the colors in this box better represent the deep story and essence of the game. Looks great! Weren't you going to make your own logo though? It doesn't matter, its a GREAT boxart! #7, I decided the official was exactly what I wanted, so I didn't see the point in making my own just for the sake of it being my own. You posted it! Looks great, man! It's not your best obviously, but it's still a really solid box that was definitely worth uploading! Oh my god dude i am in love with this thing, can you make a printable of this? #12, Whoops, didn't realize that. Printable added! It's not top-notch in quality, but it works. Alright, this came together brillianly in the WIP thread! Drakx said it best, you really did capture the atmosphere and loneliness of the Metroid Prime world, the grunge style ended up working so well. And I love the washed out colors (as I said about a billion times before) and they suit the game really well. I feel that the front could use more colour. I must just be a moogle-lover, but it just feels so bland. The back doesn't have anything wrong with it, but its just average. Nothing of this box really gets me to want to play the game. I personally think it matches well. A whole lotta colors in this design wouldn't look too great, IMO. The lack of strong/bright colors fits the Metroid series quite well actually, it fits the atmosphere especially in Prime. Colors are always the thing I've felt I have trouble working with in my Metroid cases.. AMAIZING!!! 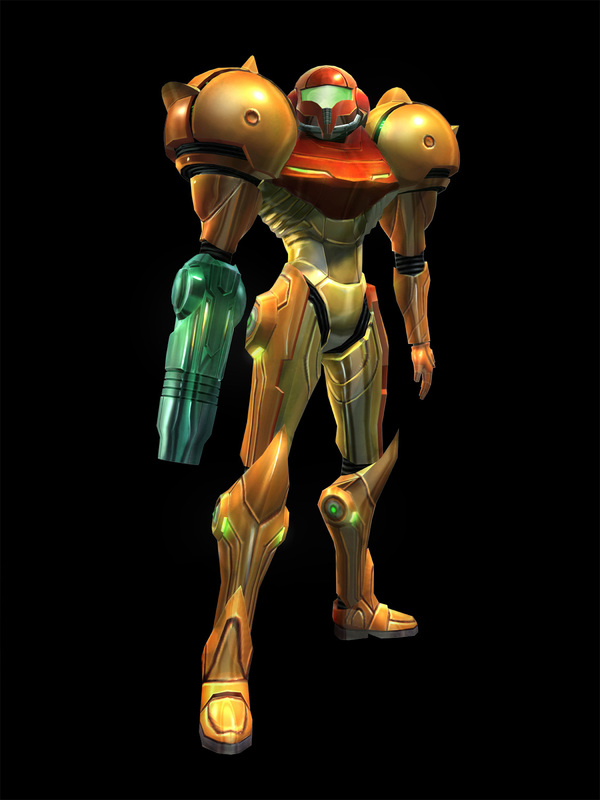 Only one problem I see, Samus's sholder is going on the template at the top. 9999999/5 +fav! Your already one of my fav auts. #20, thats SUPPOSED to be doing that. This is amazing in every conceivable way. My favorite part is how Samus is standing off to the side as if allowing the viewer to get a glimpse of what she comes in contact with. The back layout is also perfect; there's enough text (unlike many others on this site) and the Metroid overlapping one of the screenshots is so cute! This needs to get into MasterWorks. Like, right now. I actuallay wanna replace my old MP Cover with his, but I dont know in which format I should print this out. Can someone help me with that? Exec: 0.1327951 © 2004-2016 VGBoxArt.com. All rights reserved. Crafted in San Francisco by Reed.